So, I'm currently trapped in my apartment biting my fingers looking through Berrybenka's new collection "Into The Wilderness" on their website while writing this entry. Oh dear, for me it is really hard to purchase their items online from Paris because of the distance and I guess it will take forever to deliver the package here *insert crying emo here*. I'm really jealous of you guys who are living in Indonesia right now. If you don't know what I'm saying, take a look on how eye catching these pieces (below) are. Uber cool bucket bag with unique shape. 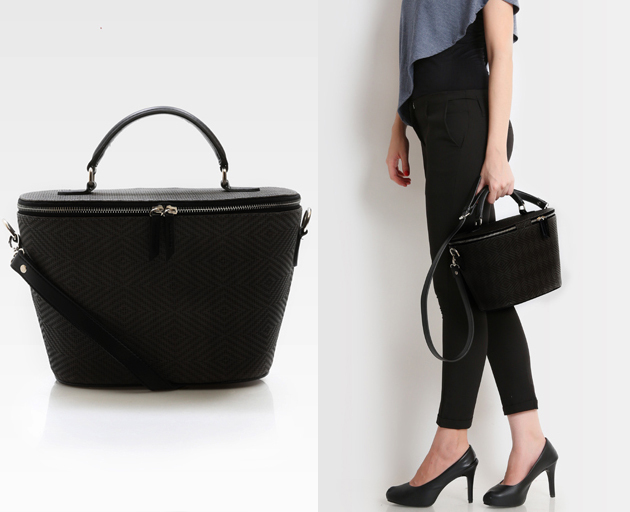 This bag has tough handle, dual zipper closure & detachable long strap for carrying option. Flirty tube dress made from premium material. This dress has gorgeous tulle layering & side zipper for closure. Be a fashion darling in this fashionable set that consists of a comfy sleeveless top & trousers with elasticated waistband, all in a flirty heart print. A semi-sheer dress with big polkadot print, long sleeves & slightly longer back hem. This dress comes with additional inner tube dress. A trendy pair of shoes with round-toe design, chunky heels & contrast trimming. Pair with your casual ensemble to upgrade the look. Make the ultimate fashion statement with this tribal inspired printed jumpsuit. It features a bandeau design with tapered legs. Be playful in this jumpsuit. Featured with tiny stripes print & front layering accent. Oh-so-fun! amazing dress by Look Boutique! i love it! "*insert crying emo here*" hahaha you're so funny! These are very adorable!! Love the polka dot high low dress. But you're lucky living in Paris! I like first dress very much! !I want buy it!! I really love the first dress, but all the clothes are beautiful. its so fun n girly. Oh dear, for me it is really hard to purchase their items online from Paris because of the distance and I Halloween mltailor Long Sleeve Mini Dresses will take forever to deliver the package here *insert crying emo here*.